So, let’s see: Fisher thinks that the problem is “uncertainty” caused by ourMuslim socialist president “fiscal and regulatory initiatives”. This happens to be just wrong, as shown by lots of evidence; businesses aren’t expanding because of lack of demand, not because they fear Obamacare. But even if it were true, you don’t have to refill a flat tire through the hole: monetary policy is what you use when demand is insufficient, for whatever reason. Things might have taken a different turn. But no, back then he was all about the “liquidity trap” and the powerlessness of monetary policy. Did his “vote” count? I don´t know, but certainly it gave support to the views of those that wanted more government. And remember that from the start (as he never misses an opportunity to remind everyone) he said the “fiscal stimulus” was not big enough! One member of the troika who opposed the Federal Reserve‘s recent decision to keep rates at rock bottom levels for two years suggested he won’t be repeating his disagreement at coming central bank gatherings. That said, the official spent a considerable amount of his speech — his comments came from remarks prepared for delivery before the National Association of State Treasurers in Bismarck, N.D. — explaining why he did not think the Fed made the right decision on its forward interest rate commitment. He indicated there was even a case to be made for going the other way on policy and tightening it. 1. The “doves” and “hawks” language is too simplistic, and does not get at what the dissent seems to be about. What Kocherlakota said in this instance makes sense. 2.Once the committee has committed to the policy and he’s registered his dissent, there’s no point in saying it again. It’s not like a typical pre-crisis sequence of meetings where there is a decision to be made at each meeting, and a possible dissent in each case. Note that he didn´t venture “making sense” of Korchelakota´s tightening bit! 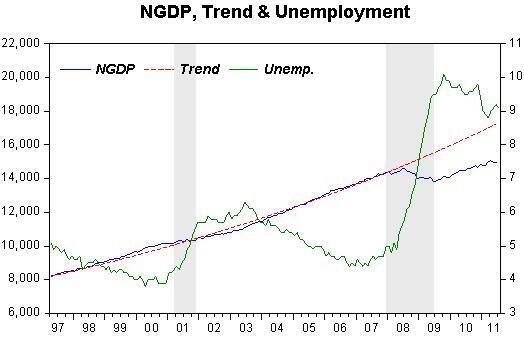 Almost two years ago, Mark Thoma and Krugman did a piece on excess capacity and unemployment. This is their picture (updated). the sooner unemployment returns to normal the better, but we need to be better prepared than we are for the very real possibility that unemployment will continue to trend upward. I’d like to see more done on both the monetary and fiscal policy fronts as a preemptive measure, we can always ease off if things turn our better than expected, but at the very least we need to resist calls from the deficit and inflation hawks to begin pulling back and continue the programs that are already in place. So what about our current situation? It’s just like the two previous “postmodern” recessions, only more so, since the bubble before the slump was in housing itself. This suggests a long period of jobless growth; so does the international evidence on the aftermath of financial crises. Note that since they wrote, excess capacity came down from 29.8 to 22.5 while unemployment only fell from 9.9% to 9.1%, and is far above “normal” for comparable excess capacity levels. 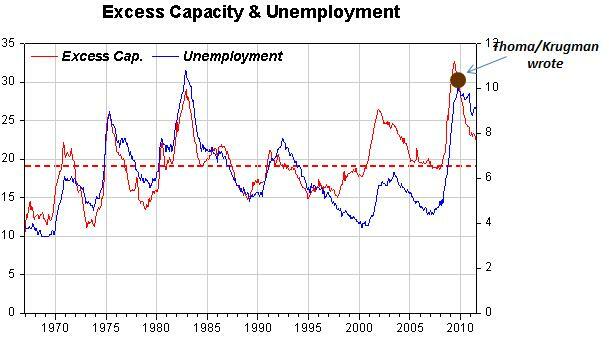 Excess capacity is one reason why monetary policy isn’t always so effective, even when labor resources are unemployed. Which is short hand for Krugman´s conclusion. In Yglesias’s mind, we need more fiscal stimulus, and he’s not sure Krueger is going to drive that home. Macroeconomic Advisers echoes that point, not about Krueger specifically, but about the idea that, if fiscal stimulus is going to work, it has to be large-scale. And in this political environment (and with credit-raters breathing down the government’s back), large-scale simply won’t fly. The bigger the fiscal stimulus proposed, the less politically possible. It’s time to face up to a long, hard recovery regardless of who’s in charge. The “real excess capacity” in the economy is brought to light by this picture that uses monthly NGDP data from Macro Advisers. Unemployment remains stubbornly high because the spending level is “stuck” deep inside the “ravine”. Monetary policy mistakes are responsible for the “plunge” in spending and inadequate monetary policy is responsible for keeping spending “submerged”. 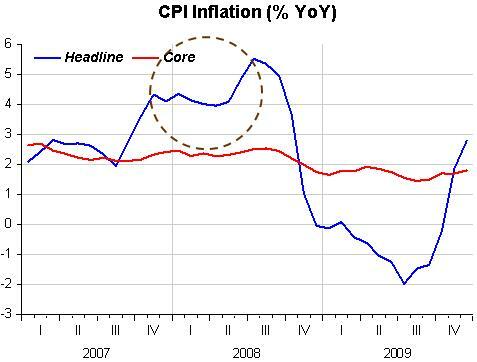 But many at the Fed seem “happy” that deflation has been avoided and inflation is within the “target bound”. Normally, monetary or fiscal policies aimed primarily at promoting a faster pace of economic recovery in the near term would not be expected to significantly affect the longer-term performance of the economy. However, current circumstances may be an exception to that standard view–the exception to which I alluded earlier. Our economy is suffering today from an extraordinarily high level of long-term unemployment, with nearly half of the unemployed having been out of work for more than six months. Under these unusual circumstances, policies that promote a stronger recovery in the near term may serve longer-term objectives as well. Couple that with the decision to make the September FOMC meeting a two day affair, so that there could more discussion (time for him to try and convince the die-hard “recalcitrant’s”? ), and a tiny light has “shined”. Yes, it´s the spending, stupid! And that´s the province of monetary policy. Federal Reserve officials debated the remaining options they have to lift a stubbornly weak U.S. economy, minutes of their last policy-setting meeting showed Tuesday. The most potent tool, a third round of asset purchases which markets have dubbed QE3, was raised as a possibility by some officials, according to the minutes of the Aug. 9 Federal Open Market Committee. “Some participants noted that additional asset purchases could be used to provide more accommodation by lowering longer-term interest rates,” the minutes showed. That´s not a “remaining option”, it´s the “only” option they think they have! How much more “uncreative” can the Fed become? JACKSON HOLE, Wyo.—After four years of fighting crises and pumping money into the financial system, the world’s central bankers are concluding that the global economy is still in a precarious position and the policy apparatus is ill-equipped to help. The mood here in the Grand Tetons, where central bankers and private economists from around the world gather each August, was distinctly gloomy. The angst was underscored in a blunt speech by the International Monetary Fund’s new managing director, Christine Lagarde. “We risk seeing the fragile recovery derailed,” she said Saturday. Those risks have been aggravated, she said, by the public’s sense that policy makers’ response has been inadequate. “We are in a dangerous new phase,” the former French finance minister said. What Ms. Lagarde said publicly, several central bankers expressed privately. The central bankers’ problems are compounded by internal divisions and current realities. Several U.S. Federal Reserve officials have doubts about how much more they can do to resuscitate a U.S. recovery that is falling short of Fed expectations. Some economists, among them Harvard University’s Kenneth Rogoff, say today’s painfully slow economic growth is the inevitable result of the massive head winds that follow a recession caused by a banking and financial crisis. Government policies, given already heavy burdens of debt on governments in the U.S., Europe and Japan, can’t overcome the relentless efforts of households and banks to reduce their debt loads. IF you were to conduct a survey of the country’s top economists, you would find a fair number who did not believe that the Federal Reserve should be taking more aggressive steps to help the economy. Some would worry that injecting more money into the economy might unnerve global investors or set off uncontrollable inflation. Others would wonder whether, with interest rates already so low, the Fed even had much power to lift economic growth. But you would also find a sizable group of economists who thought the Fed could and should do far more than it was doing. You would never know this, however, from listening to the public debate among Federal Reserve officials. That debate is much narrower. On one side are people like Ben S. Bernanke, the Fed chairman, who defend both what the Fed has done and what it hasn’t done. On the other side are the so-called inflation hawks, who say the Fed has been far too aggressive. Rick Perry, the Texas governor and arguably the Republican presidential front-runner, offered a particularly blunt version of this criticism when he recently accused Mr. Bernanke of flirting with treason. It is obviously impossible to know precisely which policy would be the best one for the struggling American economy. A dovelike injection of money into the economy would have the potential to increase incomes and inflation in a benign way, effectively reducing household debt burdens, giving people more confidence to spend money and eventually spurring hiring. But further action also brings some risk of setting off uncontrollable inflation, which, while very low historically, has been rising lately. No doubt, some of this richer hawk-dove debate is occurring behind closed doors at the Fed and in Jackson Hole. But the public conversation still matters. It affects nothing less than the Fed’s credibility. Mr. Bernanke knows that if he errs on the side of passivity — worrying more about inflation risks than unemployment — he risks only a modest flogging from colleagues and politicians. If he leans the other way, he risks being accused of, well, treason. That´s the sort of stupid and narrow minded debate that helps, more than anything else, keep the economy in deep sh–, unemployment high and future prospects bleak. Everything, and absolutely everything, has to be sacrificed so that inflation (which one no one knows for sure) stays in the 1% – 2% range. And that “inflation obsession” was exactly the reason for the economic woes the US is going through today. Many keep harping on the fact that monetary policy is “easy” by looking at “zero” interest rates although they know, or should know, that interest rates are a lousy indicator of the stance of monetary policy. 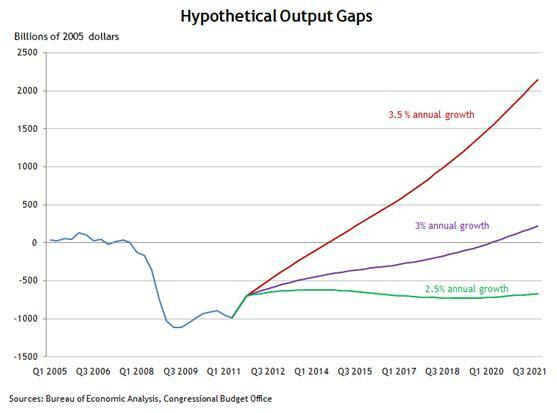 And Bernanke thinks that by communicating that policy rates will remain at “zero” for another two years is tantamount to an “easing” of monetary policy! Over the period that ended in April 2008, the FOMC strategy was to ease aggressively in order to offset the tightening of financial conditions arising from wider credit spreads, more stringent lending standards, and falling equity prices. We said that the FOMC was “running to stand still”, in that those actions did not create accommodative financial conditions but were needed to keep them from becoming significantly tighter. Since the last easing (April 2008), however, the FOMC has abandoned that strategy. Financial conditions have arguably tightened more severely since April than during the earlier period, and yet there has been no policy offset. This pattern has contributed importantly to the severe weakening of the economic outlook in our forecast. During 2007 financial conditions worsened, and as the picture below shows, monetary policy was able to keep spending close to its “target” (“running to stand still”). Once the strategy changed, monetary policy was effectively tightened (despite the “low” level of the Funds rate) and the economic deterioration was almost immediate and severe, further worsening financial conditions and contributing to the Lehman Brothers affair! The most obvious reason for the change in “strategy” is provided by the picture that depicts inflation, both in its “headline” and “core” versions. The Fed was “duped” into tightening MP from the rise in commodity and oil prices. This is surely another indication that “inflation targeting can be hazardous to the economy´s health”. The Fed, through a number of “special programs”, feeling it has “saved the financial system, thus avoiding a second Great Depression”, is content to let the economy (spending) evolve along a much lower growth path, no matter the effects on employment and more general economic prospects. A “screwed up mind” indeed! Kroszner’s summary of Bernanke’s speech: “We’re still not sure–so I’m not getting into that…..We ‘ll investigate further in September…but we may not act.” Kroszner also said that, with short-term interest rates close to zero and inflation no longer dropping, the Fed has limited powers left to spur growth. “The Fed can provide the foundations for growth, but it can’t get firms to hire and people to consume,” he said, signaling any further attempt to ease credit would not have much of an effect. No wonder spending is held back! A bunch of Central Bankers that don´t believe in the power of money and monetary policy! No matter what we do “today”. Seems to me that, to the CBO, 2012 is a sort of “Rubicon” that once crossed all the problems will naturally sort themseves out! A top economist at the Bank for International Settlements, the central bank of central banks, made a veiled criticism on Friday of Ben Bernanke‘s easy-money policies by siding with one of the Federal Reserve chairman’s chief internal critics. Stephen G. Cecchetti, chief economist at the BIS, praised Kansas City Fed PresidentThomas Hoenig for persistently speaking his mind in warning Bernanke about the dangers of keeping interest rates near zero for so long. When he had a vote on the Fed’s policy-setting body in 2010, Hoenig always voted against keeping credit so easy. “We at the BIS agree with you,” Cecchetti told Hoenig and an audience of top global central bankers, including Bernanke and European Central Bank President Jean-Claude Trichet, before presenting his paper on how high debt stunts economic growth. I like the way these guys brandish about the “easy money” mantra. 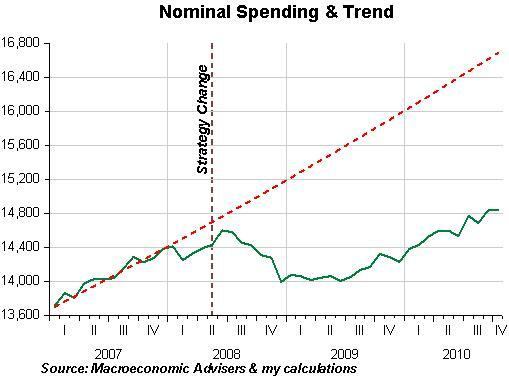 How come money is “easy” if the economy is deep inside the “spending hole” – about 15% below trend? And they call themselves “Central Bankers”? The slump in nominal GDP has had pernicious effects. It has raised both public and private debt burdens, since the ability of households, firms and governments to service their debt depends upon their nominal incomes and revenues. The gap between the performance of inflation and that of nominal GDP is so big that some economists, such as Scott Sumner of Bentley University, are dusting off an old idea. They are calling for central bankers to switch targets. Rather than directing monetary policy to hit inflation targets (as they have done for the past 20 years) central bankers should take aim at nominal GDP (or NGDP). But there you are: High debt stunts growth and “easy” monetary policy foments inflation. With the logical implication being: TIGHTEN BOTH FISCAL AND MONETARY POLICY! After all, there was something “new” in Bernanke´s Jackson Hole speech. …This economic healing will take a while, and there may be setbacks along the way. Moreover, we will need to remain alert to risks to the recovery, including financial risks. However, with one possible exception on which I will elaborate in a moment, the healing process should not leave major scars. Normally, monetary or fiscal policies aimed primarily at promoting a faster pace of economic recovery in the near term would not be expected to significantly affect the longer-term performance of the economy. However, current circumstances may be an exception to that standard view–the exception to which I alluded earlier. Our economy is suffering today from an extraordinarily high level of long-term unemployment, with nearly half of the unemployed having been out of work for more than six months. Under these unusual circumstances, policies that promote a stronger recovery in the near term may serve longer-term objectives as well. In the short term, putting people back to work reduces the hardships inflicted by difficult economic times and helps ensure that our economy is producing at its full potential rather than leaving productive resources fallow. In the longer term, minimizing the duration of unemployment supports a healthy economy by avoiding some of the erosion of skills and loss of attachment to the labor force that is often associated with long-term unemployment. Most importantly, monetary policy that ensures that inflation remains low and stable over time contributes to long-run macroeconomic and financial stability. Low and stable inflation improves the functioning of markets, making them more effective at allocating resources; and it allows households and businesses to plan for the future without having to be unduly concerned with unpredictable movements in the general level of prices. The ideal is not to “temporarily” increase the inflation “target” as some have suggested, but to set a “target” for the LEVEL of spending you want to achieve to put the economy on the long run growth path that ensures the economy is producing at its full potential. In any case, an opening to a “review of policy” was mentioned.